Last night and what was left over after the chocolate truffle dessert at the Barking Frog in Sedona. I had the shrimp tamales. Yum! And this morning, finally, the weather broke and it was a gorgeous 72 degrees. DH had to drive back to Phoenix, so he left it to me to finish the champagne left over from my birthday last night. He found me a little chocolate cake and we celebrated with cake and champagne after dinner last night. 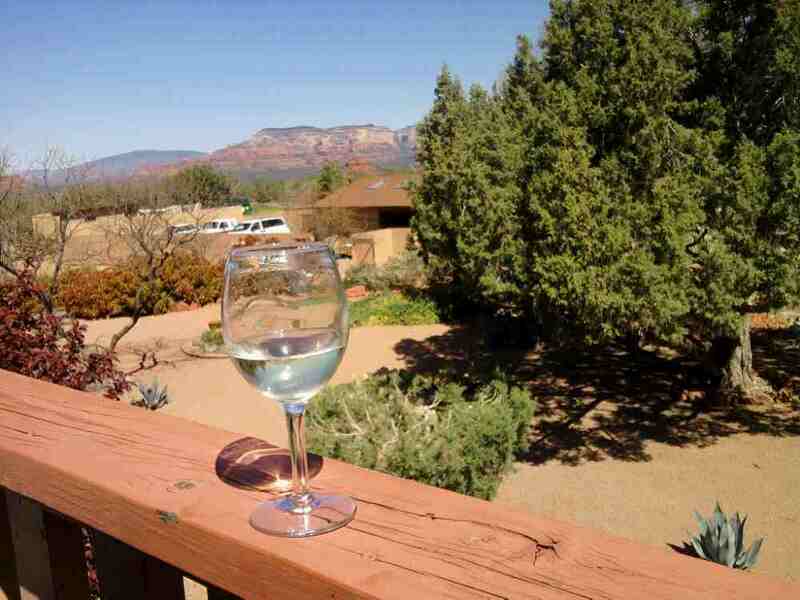 Sedona is beautiful and filled with good energy and tranquility. I made a good choice to celebrate my birthday. This has been a great vacation. New Orleans for the first half, Sedona, AZ for the second. Some day we hope to return and spend a few days in the Grand Canyon as well. Friends of ours recently remarked, "You love to travel, don't you?" I didn't realize until they said this that yes, we do! And we have had some splendid vacations, from last year's jaunt to Washington State, to other trips to Colorado, Tennessee, New Mexico, California and other places. And the best part of a vacation? It's finding a new place to explore and knowing that if you like it, you can always return. In Sedona, we ran into a couple we know, at the airport cafe restaurant. It was amazing to see them there. They were vacationing with friends. We only see them about once a year at Christmas when they come to visit her parents in Florida. So it's home tomorrow and then in a couple of weeks, I'm off to Honduras for the day job. An easier trip than Haiti, I'm looking forward to seeing and working with Linda, a wonderful, energetic woman who founded an NGO in Honduras to empower indigent women and encourage them to become self-sufficient. It sure would seem you picked the best place ever for your birthday. I hope you were able to relax and forget all but the good things. How funny to meet someone you know from home so far away. Happy Birthday Miss Bonnie and many, many, many, more. It was a wonderful vacation, Gillian and Mary. I'll have to post more pix when I get around to editing them. Thanks for the birthday wishes! New video, bath time for dogs!